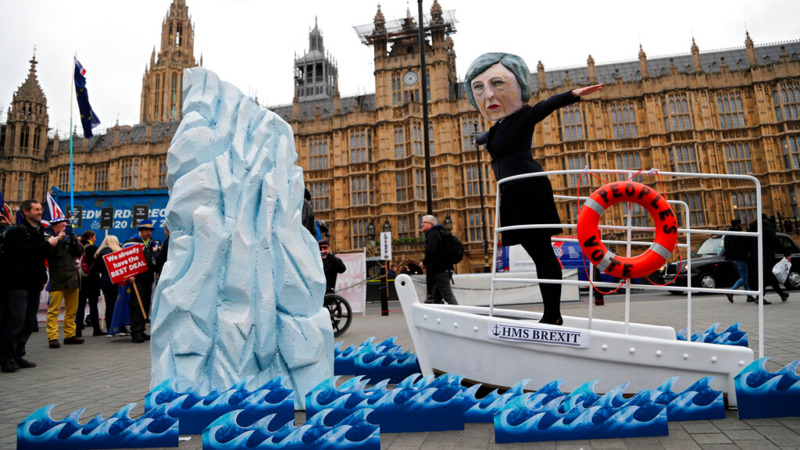 An activist from Avaaz wears a mask of Britain's Prime Minister Theresa May as Pro-European demonstrators protest opposite the Houses of Parliament in London, Tuesday, Jan. 15, 2019. 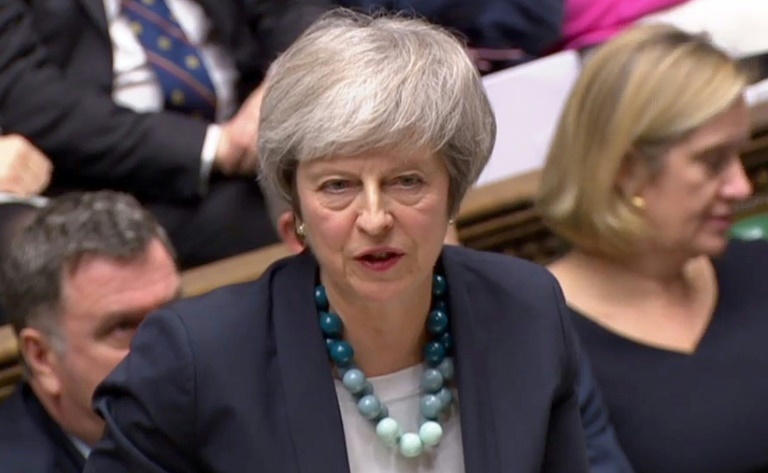 British lawmakers have rejected Prime Minister Theresa May's Brexit deal by a huge margin, plunging U.K. politics into crisis 10 weeks before the country is due to leave the European Union. The House of Commons voted 432 -202 on Tuesday against the deal struck between Britain's government and the EU in November. Legislators from both pro-EU and pro-Brexit sides of Britain's political divide rejected May's entreaties to back the deal and deliver on citizens' the June 2016 vote to leave the 28-nation bloc. The defeat leaves May's leadership wobbling and the government with just a few days, until Monday, to come up with a "Plan B." Unless a deal is ratified, Britain is set for a disorderly exit from the bloc on March 29, with potentially tumultuous economic and social consequences. British lawmakers have begun voting on whether to approve or reject the divorce agreement between the government and the European Union. Prime Minister Theresa May told the House of Commons it was a "historic decision which will set the future of our country for generations." She said the decision is one "that each of us will have to justify and live with for many years to come." Wrapping up a multi-day debate, May urged legislators to "choose certainty over uncertainty" by backing the agreement and securing an orderly U.K. departure from the EU on March 29. Her words may fall on deaf ears - all signs pointed to a defeat for the deal that would plunge the Brexit process into turmoil. Lawmakers have started voting on an amendment to the deal, followed by a vote on the deal itself. The president of the European Union's executive arm is returning to Brussels to deal with Brexit issues as they might develop after British lawmakers vote on the EU's departure agreement with the government. 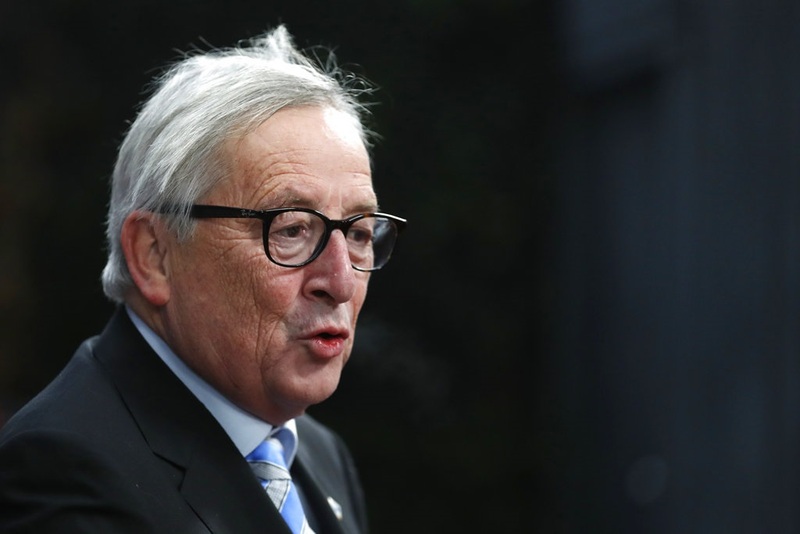 An EU official, who asked not to be identified because of the developing situation, said European Commission President Jean-Claude returned from a plenary of the European Parliament in Strasbourg "to manage the situation following the vote in the House of Commons." Juncker often has been a key EU partner of British Prime Minister Theresa May during the 2-year Brexit negotiations. The EU official said it was "important that he is available and working in Brussels during the coming hours." British lawmakers are set to consider four proposed amendments to May's Brexit deal with the EU before they vote on the agreement itself Tuesday night. There were rumors that May might be in Brussels on Wednesday. 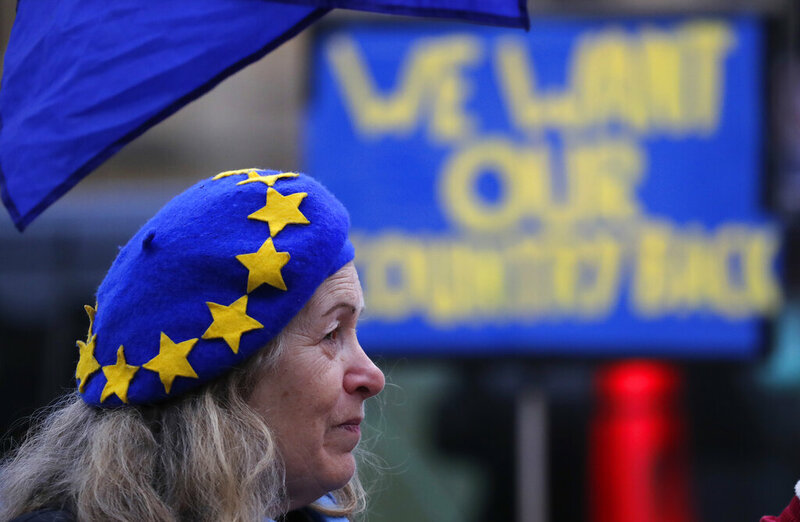 Rival groups of pro-Brexit and pro-EU demonstrators are rallying outside Britain's Parliament ahead of Tuesday's historic vote on a divorce deal with the European Union. Protesters seeking a new referendum on Britain's membership in the bloc are waving blue-and-yellow EU flags. Others, who want the U.K. to make a clean break with the EU, are brandishing placards declaring "leave means leave." A few are holding signs declaring their opponents "traitors." Britain voted by 52 percent to 48 percent in 2016 in favor of leaving the EU, and the country remains deeply divided over its relationship with its European neighbors. Some pro-EU legislators have complained of harassment by a group of militant Brexiteers, some of whom have adopted the yellow vests of France's populist street protest movement. The president of the eurozone finance ministers' group has hinted at the possibility of changing the terms of the U.K.'s Brexit deal — despite the European Union's insistence it can't be renegotiated. Mario Centeno said Tuesday that if the British parliament rejects the agreement struck with the European Union by Prime Minister Theresa May, "we will be able to change course." He tells Portuguese television channel S.I.C. that "we can always look again at the issues," but did not elaborate. Centeno, who is Portugal's finance minister, says, "Just about anything is better than a no-deal Brexit." Senior EU officials have so far ruled out a renegotiation of Britain's divorce agreement. British lawmakers will consider four proposed amendments to Prime Minister Theresa May's Brexit deal before they vote on the agreement itself. As Tuesday's debate kicked off, Speaker of the House of Commons John Bercow announced which amendments he had chosen for debate from more than a dozen submissions. They indicate the huge range of opinion among lawmakers about how Britain should pursue Brexit. One amendment from the opposition Labour Party rejects May's deal and also rules out leaving the bloc without agreement, while one from the Scottish National Party seeks to postpone Britain's departure from the EU. The other two amendments seek to limit the most contentious section of the deal, a temporary customs union with the EU intended to keep the border between Northern Ireland and Ireland barrier-free after Brexit. Voting is due to begin around 1900 GMT. Germany's foreign minister is playing down the possibility that British Prime Minister Theresa May will get a better Brexit deal if the agreement she's negotiated with Brussels is rejected by Parliament later Tuesday. Heiko Maas was quoted telling reporters in Strasbourg that while there would probably be new talks with the European Union, he doesn't believe "completely new solutions" will be offered. German news agency dpa quoted Maas saying that "we don't give up our hope that there'll be a positive vote because it would be a vote of reason — not just for Europe but also for Great Britain." British lawmakers are expected to reject the current deal May has negotiated with the EU, raising the prospect of the U.K. crashing out of the bloc at the end of March without a formal agreement. The German government is denying a British tabloid report claiming Chancellor Angela Merkel has offered to help U.K. Prime Minister Theresa May get a better Brexit deal. Merkel's office said The Sun had wrongly reported on the contents of a recent phone call between Merkel and May. The newspaper cited an unnamed senior British official claiming Merkel believed the European Union would provide more concessions to London after Tuesday's vote in the U.K. Parliament. In a statement, Merkel's office said she "gave no assurances whatsoever that went beyond what was discussed in the European Council in December and what was laid down in the letter from Jean-Claude Juncker and Donald Tusk." British lawmakers are expected to reject the deal May negotiated with the EU, raising the prospect of the U.K. crashing out of the bloc at the end of March without a formal agreement. British lawmakers are preparing to deliver their verdict on Prime Minister Theresa May's divorce deal with the European Union after two years of political upheaval. Just 10 weeks before Britain is due to leave the EU, lawmakers vote late Tuesday on whether to accept the plan or risk leaving without an agreement on future relations with the bloc. May's deal faces widespread opposition, primarily because of language designed to prevent the reintroduction of border controls between Northern Ireland and the Republic of Ireland, which some fear will indefinitely tie Britain to the EU. Former education minister Nicky Morgan warned that the U.K. wasn't ready for a no-deal Brexit, telling the BBC that "there are millions of people in this country watching Westminster and Parliament very anxiously today."